Another Delco Guy In South Jersey: What A Week! It's been a while since I posted an update, but it's been one of those weeks! 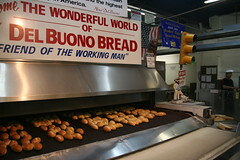 Today we started off with a trip to Del Buono's Bakery down in Haddon Heights, NJ, where the green light was on and the bread was rolling off the oven, finger-searing hot and wonderfully aromatic. We got three dozen rolls and a loaf of iced raisin bread. The rolls are the best I've had, crust and chewy, yet airy and yeasty. Now we're flipping between the Phils and The Derby. Later, we'll catch the show at RIR. It was a big week at work with the May 1st deposit day coming and everyone at UArts being generally pleased with where we are despite the economy. We announced some lay-off will be coming, which has everyone concerned, but it's not unexpected with the world being what it is. John's TAA Bats won over the STRA Royals on Thursday and Emma played very well in her Wednesday game with the Royals. Early in the week, when it was 90 plus degrees in Moorestown, we were down on LBI for CCD and John's first communion practice. Down on the beach it was about 70 degrees and breezy. Tomorrow we're headed back down there for John's big day. I'll try to do a bit better this week with updates, but no promises, these kids have us all running!